As a Shopify merchant, you’re often looking for ways to drive sales, but you’re in the majority if you find you need an injection of capital before you’ve accrued enough in savings through selling. This is especially common when your business is just starting out, or if you’ve hit a rough patch that exceeds the emergency funds you have on hand. While there are a few options that are the most familiar - namely bank loans and asking friends and family for help - it's important to consider all of your options. We've rounded up several methods that are growing in popularity because, well, they work. Let's explore alternative financing methods for small businesses that will help fund the growth of your Shopify store. In addition to financing methods for your Shopify, we also discuss a couple opportunities for you to pass savings onto your customers, incentivize future purchases, and build a loyal following. Do you have a talent for marketing, writing, or making compelling and shareable video content (or have enough to pay someone to help you)? Crowdfunding is an increasingly popular way to inject funds into your business quickly, without you having to take out a loan. Because crowdfunding typically draws from the community you have close access to (friends, family, and loyal customers), it should be reserved for special occasions – as you don’t want to financially fatigue your biggest fans. It’s great for the launch of your company, a new product line, or something else momentous and dramatic. Crowdfunding also means you’re making a commitment to those who do choose to donate; deliver, or suffer an incredible amount of bad press. Two mainstream and well-known platforms for crowdfunding include Kickstarter and Indiegogo, which allow you to run a fundraising campaign through their websites. Crowdfunder is another great resource, allowing you to create the fundraising campaign directly within your Shopify website rather than on a third-party platform. If you have a loyal following, but you need funding to produce a new offering, your best bet is to use a pre-order strategy. 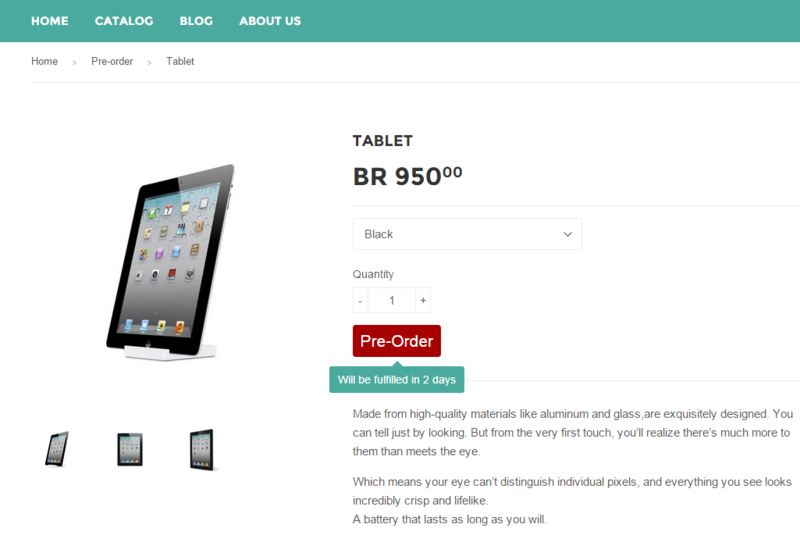 To do this, place products on your site for purchase before you actually purchase the inventory. As customers order these products, the money they provide to pay for the goods can be used to directly fund the creation of the goods. It cuts down on upfront production costs as well as the burden that increasing inventory can have on your business, and it can be a great way to build momentum and excitement for your coming release! For help managing and organizing your pre-order strategy, we recommend using the Pre-Order Manager widget in Shopify. With this addition to your Shopify store, you can deploy and manage your pre-order strategy, as well as control the number of pre-orders you receive for any given product. I know, we started off this article talking about how you can avoid loans, but sometimes they really are the right choice. That doesn’t mean, however, that you should run to the bank right away. For entrepreneurs and small business owners looking for an influx of cash funding, peer-to-peer loans are a great alternative, usually offering better rates while connecting you to like-minded individuals. It’s certainly an option to consider carefully, however it can be a helpful way to get the money you need with a low, fixed rate. We recommend Prosper as a company for attaining a peer-to-peer loan; they offer counseling services around small business finances as well help guiding you through the process of paying back loans. One of the newest financing options to gain popularity, inventory financing is a bit more high risk, but may be a great option for a company that is confident that they can sell their inventory in a timely fashion. When you choose this route for gaining capital, you use your inventory as collateral to take a loan out. This can be ideal when you know your stock will sell, but you, for example, must pay your vendors quite soon. Kickfurther is our pick for inventory financing. They encourage sponsors to select brands that offer products they appreciate, which means that it can also turn into a powerful marketing and business networking tool. This is a more traditional form of credit and lending, wherein a business uses their incoming invoices and sells them to a 3rd party at a discounted rate in exchange for a line of credit. It’s a way of leveraging your incoming receivables as assets to receive cash in hand. Fundbox is a great company for this process, as they value the health of your business, not the health of an individual’s personal credit, when assessing the credit line you qualify for. They provide an assessment of your business’s assets and growth potential, allowing customers to pay back their debt over time. Did you know it’s possible to utilize analytics from your in-store and online sales to help you secure a loan amount and line of credit tailored directly for your business? Using Shopify Capital you can receive a line of credit from Shopify itself, using the analytics from your e-commerce sales history. This allows you to gain access to a line of credit quickly, without having to fill out additional forms or provide your sales history. Another great company that creates a customized lending strategy based on your sale history is Clearbanc. They automatically generate credit options tailored to your sales history, provide flexible payment plans for returning their investment, and offer a one-time fixed fee for this transaction.